“Black Widdow” is the latest release of Tatanka Kaligawa, designer of Mea Culpa. A beautiful black and mystical gown that turns heads everywhere. The long gown is decorated with amazing silver ornaments that go over the whole outfit. The prims that are attached in the back give a lightly asian touch, and make a wonderful transparent contrast. The big “fan” looking back parts are lightly transparent and wonderful flexible and move behind with every step you take. The clothing layers are made of amazing detailed textures that give the whole gown a fantastic formal and sophisticated touch. The shoulders carries very noble and lightly puffy sleeves. A total eye catcher is the hat. it is connected to the spine and “hovers” over your head. Lace hangs down in the back and the front is decorated with light silver lines. On the top of the hat you can find 2 awesome flowers that add a lightly sweet touch as a sweet contrast to the spiky, silver neck collar. On every ballroom event or dinner party you will be the center of view with that fabulous gown! The body itself is only covered by a wonderful short body suit without sleeves. At the belly you have an awesome gold framed space where you can show off wonderful belly jewels also 😉 The center for this outfit is definitely the back where the big, fluffy pink and purple parts and feathers are attached. The hips are ornamented with little feathers too. The feet are covered by 2 pink parts too what bring the theme of the outfit lovely back at the bottom. Silver, spiky additions are the ankle parts, the shoulder attachments, the chest decoration and the fabulous head jewelry. A combination of noble metal and feathers make the perfect head pice for this extraordinary design! 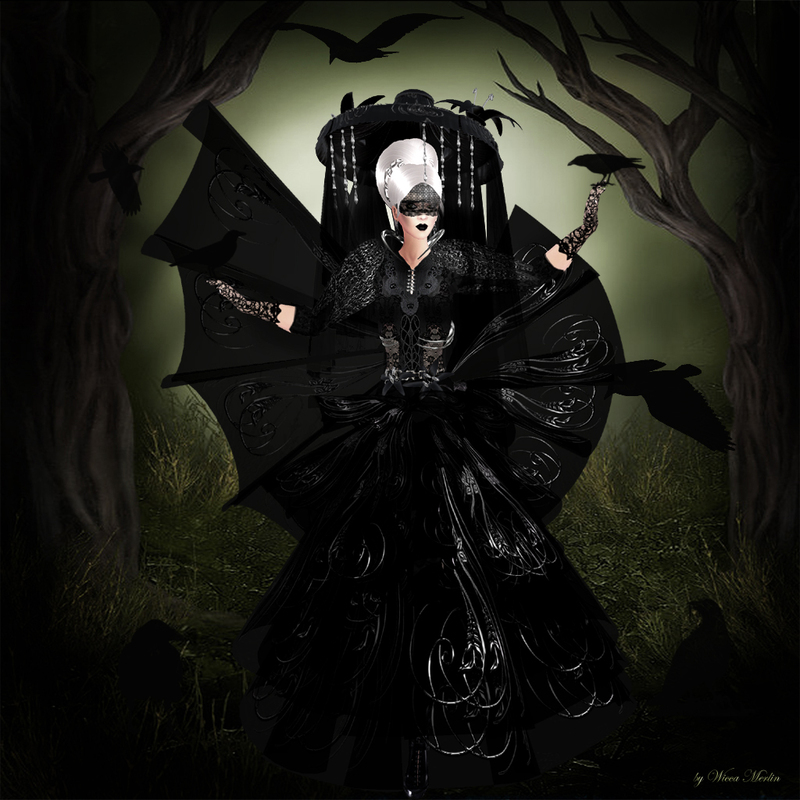 This entry was posted in Fashion, New Releases and tagged Arisia Ashmoot, asian, Baiastice, Black, Blog, Blogger, Body Talking, Clothing, Dancer Dallagio, Fashion, Female Clothing, Gown, Hat, hatpice, Haute Couture, Jewelry, lace, Latest Release, Mea Culpa, Model, Modeling, New, New Release, Nuuna Nitely, Nuuna's, Nuuna's Skins, Ornaments, photographer, pink, Poses, purple, Release, Second Life, Secondlife, Showgirl, showgirls, silver, Sissy Pessoa, SL, SL Clothing, SL Fashion, Style, Tatanka Kalligawa, Wicca Merlin. Bookmark the permalink. Cool black dress, it projects this image of a myterious yet powerful woman. The other is just average, it looks too flashy. wow…Amazing pics, congrat girls!! … and the Noite do Brasil is fabulous!! So… im suspect for say this ^^ (more one brazilian girl in sl o/) and I’m glad to see attention focused on Brazil in the fashion world without necessarily being made Brazilian pro … I loved it!